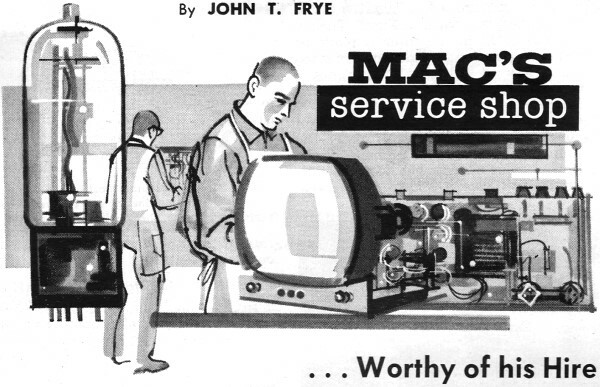 "You don't see any doctors handing out any free diagnoses, do you?," asked Barney, rhetorically, when discussing with Mac the expectation of many customers for them to troubleshoot an electronics appliance to determine what the cost would be to restore it to working order. An article is cited from a trade magazine where a customer refused to pay a repair estimate fee even though he decided not to get the work done. It is the age-old lament about people who expect you to perform work for them at no cost, but would never consider plying their trade for someone else for free - and the Internet had not even been invented at the time. Barney had been down to Center City for two days attending a color television service clinic put on by a manufacturer. His employer had had quite a time persuading the youth to go, for Barney simply couldn't convince himself Mac could keep the store without him; but finally the prospect of a couple of days in the city with all expenses paid won him over. Wednesday morning, though, bright and early, he came bouncing into the shop with the air of a knight returning from a long crusade. 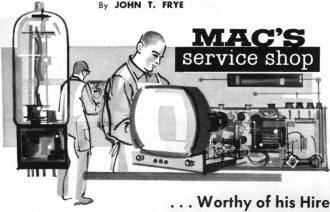 He made quite a production of presenting Matilda, the office girl, with a dainty little compact he had bought for her; then he marched back into the service department and thrust a black metal object into Mac's startled hands. "What's that?" Mac demanded as he stared down at it. "Well, a little like something that started out to be a hand stapler and didn't quite make it," Mac hazarded. "It's a nibbling tool. Here, let me show you," Barney said, taking the instrument from Mac's hand. He grabbed up a little sheet of aluminum and held it against the top of the tool as he worked the handle vigorously. The device ate through the aluminum, leaving a quarter-inch-wide gap behind it. Barney executed sweeping curves and right-angle turns in the clean-edged path cut by the nibbling tool. "It's actually a little hand-operated punch that stamps out a bite about a sixteenth of an inch deep and a quarter of an inch wide every time you work the handle," he explained. "You can cut up to 18 gauge steel or up to 1/16" copper or aluminum with the thing, and you don't have to cut in from the side. All you need is a 7/16" hole to give the tool a start. And it's real neat the way you can nibble right along a guide line. I figure it will be the cool, cool cutter for enlarging a chassis opening to take a slightly bigger replacement transformer, for making permanent templates out of sheet metal, or for cutting any odd-shaped hole in chassis or panel for mounting things. I know we'll find lots of uses for it here on the bench, and I'm hoping you'll let me borrow it now and then when I'm building something for my ham shack and need to nibble some special holes." "Wel-l-l-l, I'll think about it," Mac promised with a teasing grin; "but thanks a lot, Barney. It looks like a real handy gadget, but you shouldn't -"
"Hey!" the redheaded youth interrupted as he glanced across at the set-to-be-repaired rack, "where did all the beat-up radios and TV sets come from?" "Now when a customer says that, all your caution flags should come unfurled and flutter warningly in the breeze. His wife has presented him with a problem, and he's sliding out from under by dumping it squarely into your lap. He wants you to spend your time; use your expensive tools, instruments, and service literature; and apply your hard-earned technical knowledge to confirm his already-made decision not to spend any money on his ailing device. What's more, in a surprising number of cases, he expects you to do this for free." "Yeah! How about that?" Barney exclaimed. "Did you see the story about the dealer who took in a 14" portable TV set with instructions from the owner to let him know how much it would cost to fix it? Checking revealed the set needed a new CRT and two other tubes. When this information was telephoned to the owner, he said to let the set go and he would pick it up. When he came in, he refused to pay the $3.50 estimate fee and walked out. Shortly thereafter he sued the dealer for $115 damages plus the cost of renting a TV set while the portable was being held. The court ordered the dealer to return the set without charge and to pay the owner $30 for renting a substitute. Don't you think that's pretty dirty pool?" "I saw the story in the February 'Service Industry News' column," Mac replied; "but I hesitate to pass judgment on the court's decision. Maybe some factors in the case didn't come out in the story. We have to believe our courts hand down decisions that are fair and just according to the evidence presented. Let us start doubting that and we're all in big trouble. But that single decision certainly can't mean technicians don't earn and deserve a reasonable amount for the time and effort they spend in locating all the troubles in a set and determining the cost of repairing these, even though the owner of the set subsequently decides he doesn't want it repaired." "I hope to kiss a pig, it can't!" Barney exploded. 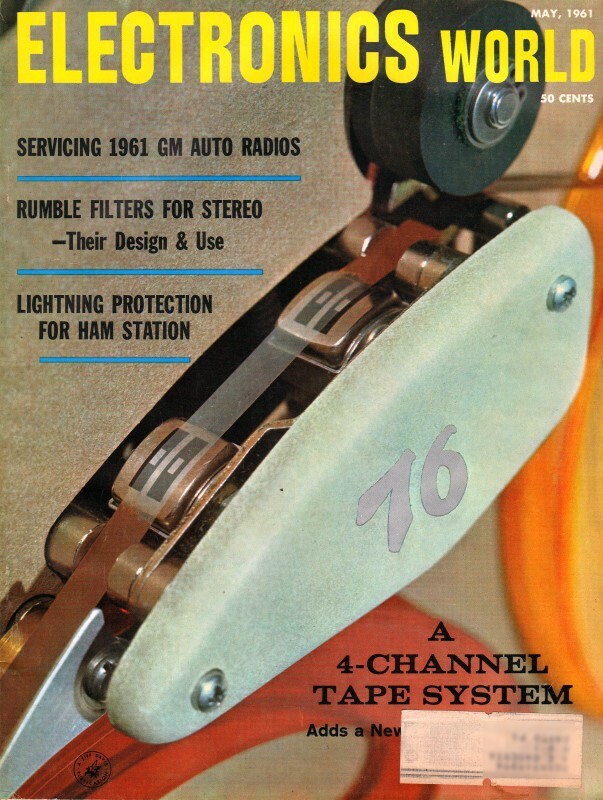 "Anyone with a lick of savvy about radio and TV servicing knows that the part of a service job that takes the time, the equipment, and the brains is locating the trouble. Once the trouble is diagnosed, a ten year old kid could usually make the repair, which probably consists of snipping out a defective part and soldering in a new one. You don't see any doctors handing out any free diagnoses, do you?" "No, and maybe there's the rub: they call their troubleshooting a 'diagnosis'; we call ours 'making an estimate.' That word 'estimate' carries with it a certain connotation of quick, rough guessing; and it is quite often seen in the company of another word, 'free.' Yesterday, for example, I had a floor covering man come up to give me an estimate on the cost of putting inlaid linoleum on the floor of a room at our house. He came in, measured the room both ways with a six-foot steel tape, stared up at the ceiling for a few seconds, jotted down some figures on a piece of paper, and said, 'It will cost $204.50.' He was in the house five minutes; the cheap steel tape was all the equipment he used; and he was figuring on a job that would bring him in more than $200 if he got it. He could well afford to make a free estimate of this sort. "But compare that with what happens when we take in a portable TV receiver for an estimate. We check all the tubes with a tube tester costing more than the TV set cost when new. This operation alone consumes twenty to thirty minutes if done right. If the trouble is not tubes, we may have to use a $200 scope, a $50 v.t.v.m., a $150 sweep generator, and our service library in which we have invested more than $1000 to locate the difficulty. It's not at all unusual for us to spend a full hour on a set that has been out of commission for some time and may have three or four different things wrong with it, for the only way we can be certain we've located all the troubles in the receiver is to restore it to normal operation - in other words, actually to repair it on a temporary basis. "Consider another angle: if your face swells up and you call in the doctor, he will look at you, ask you a few questions, and tell you that you have the mumps. Then he will prescribe for you, give you some advice, separate you from five to ten dollars, and be on his way. He does not go ahead and check out your lungs, heart, kidneys, liver, digestion, and metabolism. You are sick; he has found something wrong with you; and that is that. "But when we come across a single bad tube in our testing, we don't immediately grab up a pad and start figuring the repair bill. We go right on testing the remainder of the tubes. Then we replace the defective tube with a new one and turn on the set. All the controls are operated; all the channels are checked out; and the TV set is watched closely and critically for any sign of faulty operation. We know if the owner tells us to repair the set, he will expect it to operate perfectly when he gets it back, no matter how sketchy his original complaint might have been. And if he doesn't want it fixed, we have to remove all the new parts we installed to make the set operate." "Yeah, and if it's an average case and we do get the job, our total bill will be under $20," Barney interrupted. "True," Mac agreed, "and you can see that all these things add up to a vast difference between the rough 'estimate' given free by many salesmen who gamble a small amount of time and no equipment on the possibility of securing a job running into hundreds or even thousands of dollars, and the careful and complete troubleshooting job performed by a radio and TV technician. Yet the latter often calls his time-consuming diagnosis an 'estimate,' too. Everyone should realize the difference. That's why I've had these new claim tickets printed," he said as he handed one to Barney. "Notice the part that stays with the set says in easy-to-read type that a charge is made in every case for the labor, equipment, and knowledge used in locating the trouble. If the device is repaired, this charge becomes part of the total service charge; otherwise it will be collected when the set is surrendered. The ticket further states this charge will be $1.50 for a small radio or record player and $3.50 for a TV set, tape recorder, or hi-fi system delivered to the shop. If the equipment has been subjected to unusual damage by fire, water, lightning, or tampering, the charge will be higher. When the owner writes his name and address on this ticket, he cannot help but see the statement of policy immediately above: but we'll still have a sign prominently displayed that states a charge will be made for locating trouble and determining the cost of repair." "Do you think that will protect us if some chiseler tries to get out of paying the charge?" "I don't know for sure, but I do know that 'intent' carries a lot of weight in any court of law. If we can show we did everything we could to let the customer know he was going to have to pay for the time, equipment, and knowledge used finding what was wrong with his set, that will certainly establish our intentions were honest and above-board. It will be pretty hard for him to deny knowing he was incurring this charge when his claim stub matches a ticket with his signature below a clear statement of our policy. Notice we do not use the word 'estimate' at all. We speak about work done, equipment used, and knowledge applied." Mac paused and then concluded thoughtfully: "A long time ago, in the Book of Luke, if I remember rightly a very wise Judge said, 'The labourer is worthy of his hire.' I doubt any modern day judge, when he clearly understands the circumstances, will try to reverse that decision."